By Pete Thomas. From the Los Angeles Times, November 30, 2009. “This Saturday, November 28th, I received a phone call from our dockmaster, Mario, around 8 a.m. to tell me that our 54-foot Bertram ‘Get Over It’ was hooked up to a very weird fish and they asked, ‘What should we do?’ I immediately got on the phone with the captain Jobe Villavicencio to see what was going on. 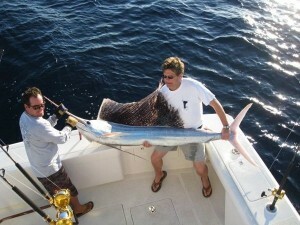 Jobe was very excited saying they were hooked up to a sailfish that was completely white. “Incredulous I got on the internet and found that a couple of ‘albino’ sailfish had been caught before, one aboard a commercial boat in Manzanillo, Mexico and another in Guatemala. The captain wanted to know if he should boat the fish or release it. This put us in a bit of a dilemma; knowing how rare this fish was, we knew that it would be very valuable to local scientists, however we had paying clients on board and the decision had to be theirs, when you charter a boat from Pisces you get to call the shots, it is your boat for the day.